On the Experience Optimism website, I have commented about the communication tactics of Optimist International many times. I fully believe that it could communicate more effectively with the members of the Optimist Clubs that make up the organization. Plus, with the annually-imposed stop and start date of September 30 and October 1, it is as if one day you're in, and the next day you're out. Or is it? I've come to realize that perhaps, sometimes, one is never in the communication loop at all. Some may have noticed that this administrative year has been especially non-communicative. It seems that very little information has trickled down to our clubs because as a club president, I have yet to see a district bulletin or even an email message from the governor. Almost six months have passed and while I know to go to the district website for information and meeting registration, I'm especially disillusioned to see that there is nothing listed, as of this writing, for the 3rd and 4th quarter district meetings, no minutes from the first quarter meeting, no financial reports, and no district goals or expections, among other things. Districts have two purposes in Optimist International: to help Optimist Clubs succeed and to help Optimist International grow. Optimist International President Jim Kondrasuk has bundled the two purposes together this year by declaring it to be the Year of the Honor Club. 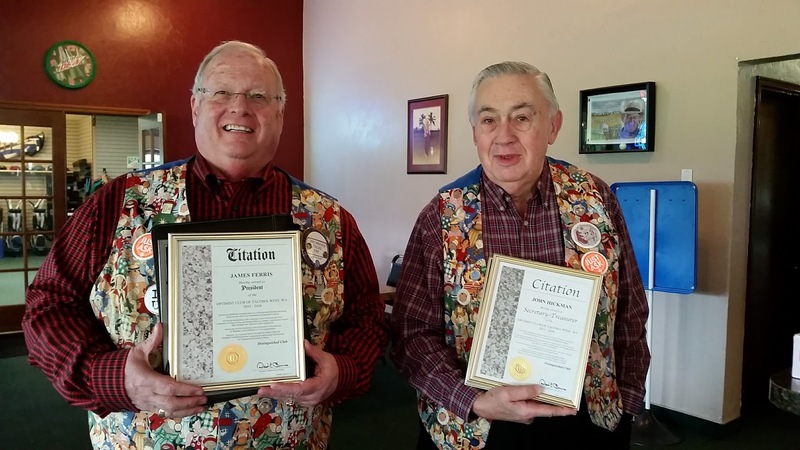 When an Optimist Club earns Honor Club recognition, it has availed itself of the services from Optimist International and its District to host effective programs and recruit and retain members. Without communication, we don't know the specifics of the programs for the year including how to involve our youth contestants in the International Scholarship programs. Or, for instance, do you realize that Optimist International is awarding $500 each quarter for membership recruitment? This year marks 30 years that I have been a member of an Optimist Club and over the years I have watched club presidents, district leaders, and international leaders approach their roles with various styles. The most successful are the ones who communicate their goals, restate their goals, work toward their goals at every turn, and monitor progress, reviewing it with others all along the way. Some do that by creating, following and reporting on a published strategic plan. 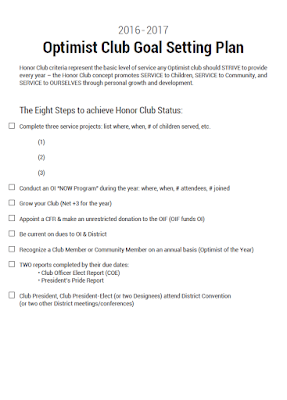 Although some might want to do more during their leadership term, I suggest that Honor Club is the baseline. 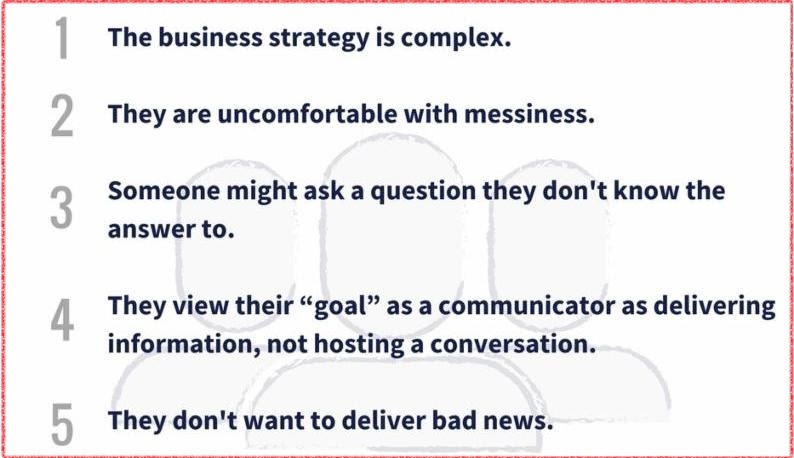 Once a leader starts communicating that, the rest of the story to be communicated will fall into place. 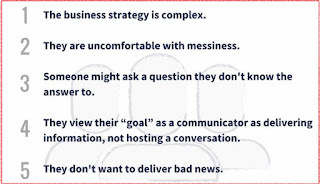 Need help developing a communications plan? Contact Linda Vaught, public relations communicator at Experience Optimism. NOW is the acronym for New Optimists Welcome, a long-standing membership development program for Optimist Clubs. For as long as I can remember, Optimist Clubs have sponsored NOW activities for membership recruitment. 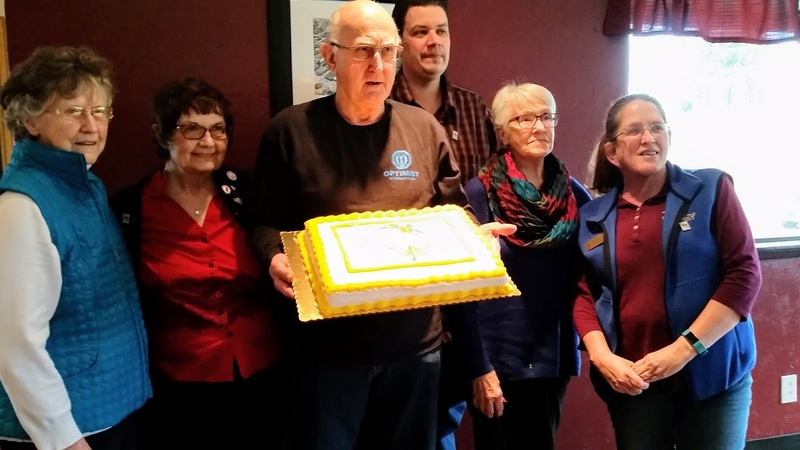 The NOW concept is simple - Your Optimist Club invites a group of prospective new members to a single event, explains what the Optimist Club is and what it does in the community, and then asks those assembled to join. When one person says yes, the group dynamics emboldens others to join as well. Over the years, it has proved to be quite effective; however, it is important to follow the guidelines. Straying far from the recipe can lead to poor results as potential members become lost in the program delivery. The entire activity should be approximately one to one and one half hours long. It's important to respect your attendees time and to offer them value for their attendance. Networking and learning about something good in their community are benefits for small business owners and the efficient timeline allows them to move on to their next appointment in a timely manner. Such a first impression will encourage busy, career-minded individuals to give your Optimist Club a try. NOW all you need to do is give them the opportunity to join an Optimist Club. Optimist International President Jim Kondrasuk has declared the 2016-2017 administrative year to be the Year of the Honor Club. What's this? Isn't every year the year of the Honor Club? Each year, less than 25% of all Optimist Clubs earn the Honor Club recognition, so that means even fewer go on to receive the Distinguished Club designation. We can do better than that! 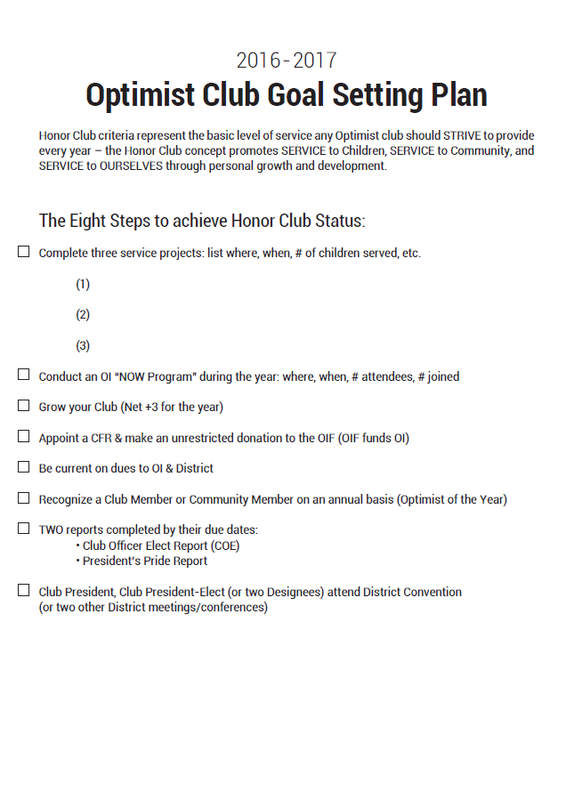 Clubs that meet the Honor Club designation have completed the minimum steps to ensure their Optimist Club is healthy and growing to serve future generations. Clubs that earn the Distinguished Club designation have served not only their club and community, but they have also expanded the reach of Optimist International by starting a new Optimist Club or adding fifteen or more new members to their club, equivalent to starting a new Optimist Club. 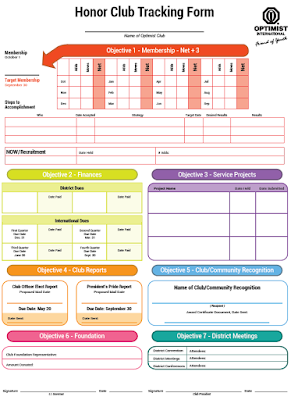 In an effort to encourage more Optimist Clubs to seek the best in administration, community service and growth, President Jim created a Goal Setting Plan for 2016-2017. In case this is the first time that you have seen this plan, be assured, March is as good a time to get started as October. 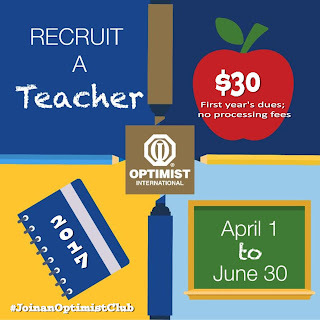 There's plenty of time to make your Optimist Club an Honor Club. Please do your part to make certain that your Optimist Club is an Honor Club. Together we can make our communities and our organization healthy, vital and brimming with optimism. Together we can. In 1987, women petitioned to join service clubs. Rotary International took on the fight all the way to the Supreme Court and lost. A decision was made that women could not be excluded from these austere groups. 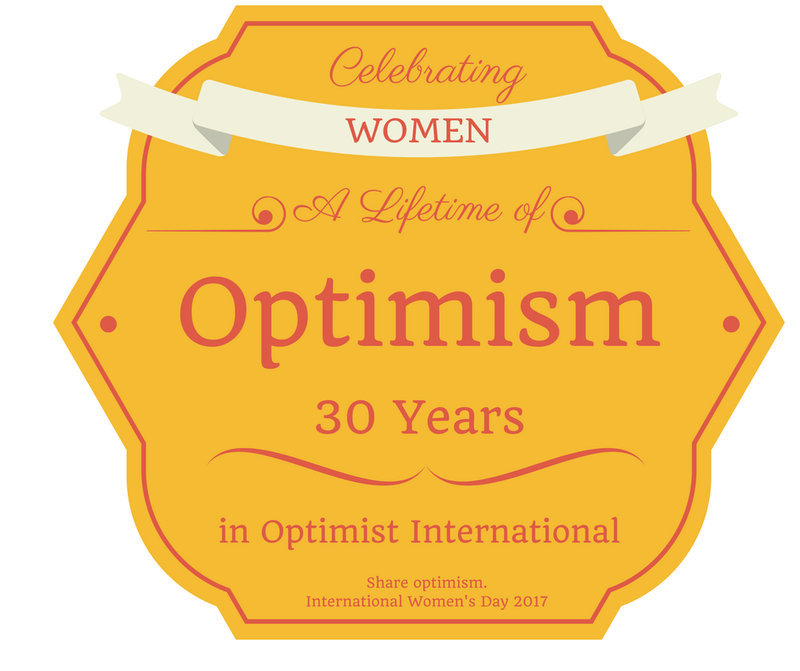 Several weeks ahead of the decision, at its 1987 convention, Optimist International voted to allow women to join. I've heard stories about how the motion failed, and failed, and failed, only to be brought up again and passed at the business session that, by some accounts, ran as late as 2:00 in the morning. 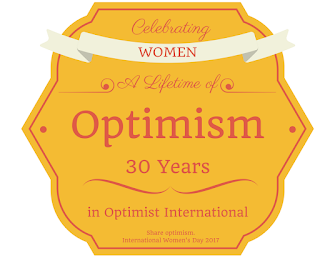 On International Women's Day 2017, I salute those who fought to do what was right and thank you for the opportunity to serve as an Optimist Volunteer. Bill Upton is 75-years-old. When he was 51, he had a heart attack and at 55, five stents were placed in his heart. Seven years later, two more stents were put in, but none of the surgery has stopped Bill from raising money to support youth programs in his home town of Oregon City, Oregon. His latest effort is a cross-country bicycle ride in honor of the Oregon City Optimist Club, especially its pay-to-play school sports grant program. "I should probably be raising money for the heart people, but I really admire the Optimists and their dedication to kids," explained Bill. A former teacher and coach at Ogden Middle School, Bill likes that the Oregon City Optimist Club is always available to help with youth and community service projects. Some of its projects are the Oregon City High School's JROTC program and graduation party, Pioneer Pantry, the Oregon City Public Library, Angels in the Outfield, Building Blocks for Kids and the Sycamore Lane Therapeutic Riding Center, among others. Bill and six friends are leaving on March 5, 2017 from San Diego, California. They will take a 50-day, 3,100-mile journey to St. Augustine, Florida. 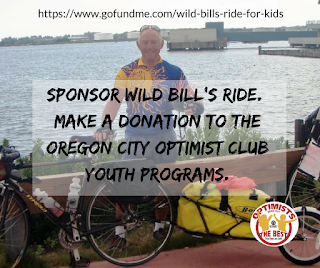 He is confident that he can make the trip and asks that you cheer him on by making a donation to the Oregon City Optimist Club in honor of "Wild Bill," as he has been dubbed by the Oregon City Optimist Club members. The Oregon City Optimist Club would like to thank you for your support. Reciting the Optimist Creed will always lift your spirits and give you hope. 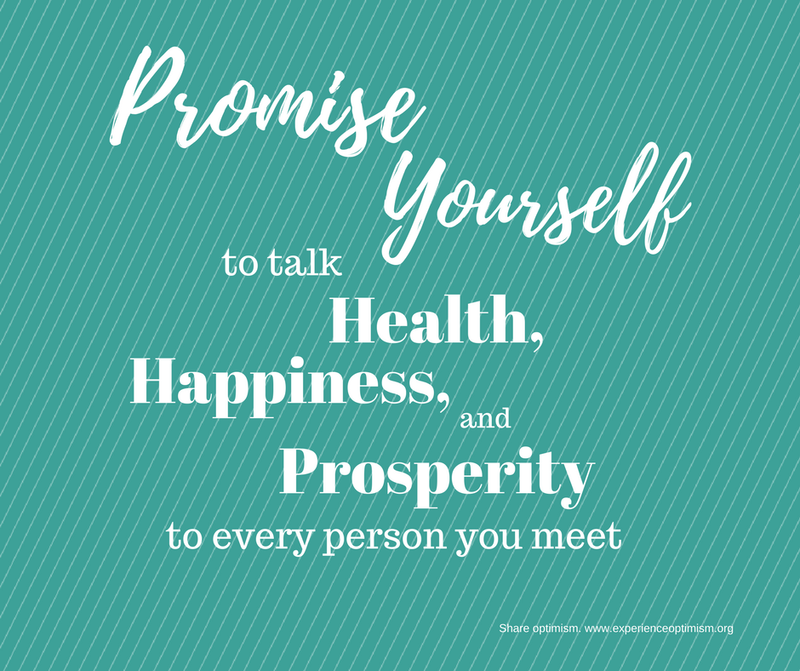 Today's post is to also give you a reminder to talk about good things: health, happiness and prosperity. It's rather easy, given today's political climate, to talk about negative topics. Fake news, alternative facts, and indiscriminate practices seem to take the forefront. As optimists, we must fight back. We've often said, why can't there be more good news on the television and in the newspaper? Why can't there be more good news in my Facebook feed? I ask, why aren't Optimist Clubs more widely sharing their projects and positive way of life? As I pondered that question this morning, I realized that in the Pacific Northwest District, only fifty percent of the Optimist Clubs have an online presence. That's not enough! Let me help you get your Optimist Club online. There are low and no-cost options for your Optimist Club to pursue. Send me a note and let's get started today. 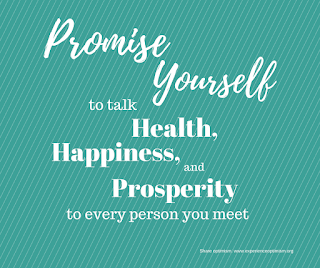 Let's share optimism by talking about health, happiness, and prosperity to every person we meet, in person, online and beyond. Let's work together to make the real news good news.